Both sides will reportedly ink an agreement in principle on military technology. Japan and the Philippines are expected to conclude a deal this week on the sidelines of a regional economic summit paving the way for Tokyo to supply Manila with military equipment that could be used in the disputed South China Sea, Reuters reported November 16. 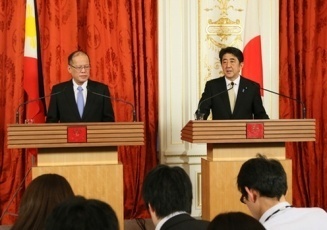 Though Japan and the Philippines have long had a close relationship, growing anxieties about Chinese actions in the East and South China Seas have led both countries to strengthen their defense ties under a strategic partnership first inked in 2011 (See: “Japan, Philippines Strengthen Strategic Partnership”). In January, as I reported for The Diplomat, the two sides had signed a memorandum of understanding outlining specific steps to enhance defense cooperation which included capacity-building and collaboration on defense equipment and technology (See: “Japan, Philippines Boost Defense Ties”). Now, in a further indicator of deepening defense relations, sources in Tokyo have disclosed to Reuters that Japanese Prime Minister Shinzo Abe and Philippine president Benigno Aquino III will announce an agreement in principle on military technology following their meeting Wednesday on the sidelines of the Asia-Pacific Economic Cooperation (APEC) summit in Manila. The agreement would commit both sides to discuss the type and scale of Japanese military aid and will not include specific aid for now. But sources were cited as saying that Japan may begin by supplying three Beechcraft TC-90 King Air Planes currently used to train Japanese Self Defense Force pilots that can be fitted with basic surface and air surveillance radar, followed by used Lockheed Martin submarine-hunting P3-C patrol planes. The equipment will be in addition to previously announced moves, including the transfer of ten patrol boats to the Philippines announced back in 2013 confirmed to begin in 2016 (See: “Japan Wins New Philippine Defense Deal”). Both sides have also committed to exploring a visiting forces agreement that would give Tokyo access to Manila’s military facilities that the United States and Australia now enjoy (See: “Japan, Philippines Seeking New Pact on Military Bases”). The report is yet another indicator that security issues on the sidelines of the economic summit are expected to dominate the headlines. As I had reported earlier, U.S. officials have said that the bilateral interactions U.S. president Barack Obama will have in the Philippines, one of five American treaty allies in the Asia-Pacific, will focus on maritime security (See: “Obama Philippines Visit to Focus on Maritime Security”). Philippines to Hold Military Exercises with US, JapanJapan, Philippines to Finalize New Military Aircraft Deal For Five TC-90sJapan Submarine, Destroyers Visit Philippines Philippines To Get Five Aircraft from Japan Amid South China Sea TensionsJapan’s New South China Sea Gift to the Philippines?